TV personality Regis Philbin weighed in on the American presidential race during a visit to Toronto on Tuesday, lending his support to long-time friend Donald Trump. The former TV host said he thinks Trump is "doing alright for himself," but that he wished the Republican candidate would dial down some of his inflammatory appearances. "I wish he would calm down a little bit, but I'm not going to get involved," Philbin told CTV's Canada AM. Asked whether Trump would make a good president, Philbin said America will have to wait and see. "I think that he'll be on fire if he becomes president," he said. "It might be the best thing that ever happened … for him and maybe for the country. We'll all find out together." Philbin made the comments while visiting Toronto to speak about heart failure on behalf of the Heart and Stroke Foundation. Philbin has been outspoken about the cause since leaving "Live! With Regis and Kelly" five years ago, and experiencing his own brush with heart problems in the 90s and early 2000s. According to a recent survey by the foundation, many Canadians have misconceptions about heart failure. The condition occurs when the heart becomes weakened or damaged, and it affects the heart's ability to properly pump blood. This can cause a number of complications, including fluid back up in the lungs and other body parts, congestion and lack of oxygen, the foundation says. But half of Canadians mistakenly believe heart failure is when the heart suddenly stops beating, the foundation's survey found, and more than half think that heart failure is impossible to prevent. Philbin worked to dispel some of these myths on Tuesday, by sharing his own experiences with heart failure. "I've been through it," the TV personality said. Philbin said his first experience of heart problems was in 1993, while he was shooting in Miami. "All of the sudden I felt this going on," he said, tapping his chest. "I wound up in the hospital down there." Philbin underwent an angioplasty, which temporarily relieved his problems. Then, in 2007, he underwent triple bypass surgery. Now, he's urging anybody experiencing the symptoms of heart failure to contact a doctor. "It's important to get it done," he said. The Heart and Stroke Foundation says heart failure warning signs can include shortness of breath, sudden weight gain, tiredness, loss of appetite, and swollen ankles or feet. 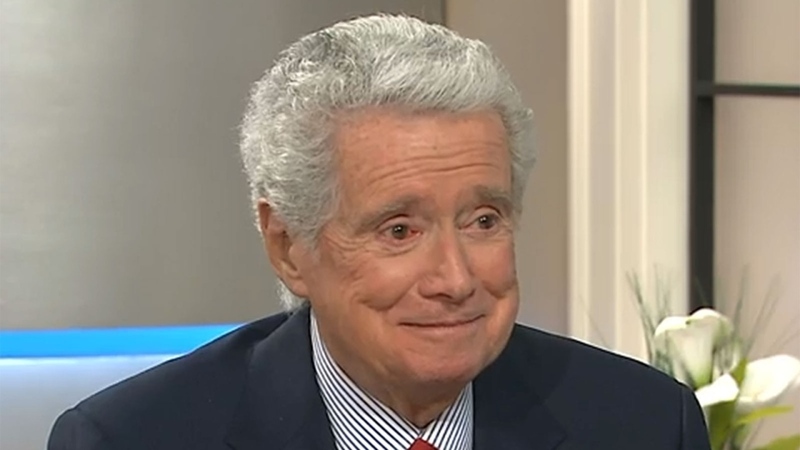 Regis Philbin appears on CTV's Canada AM on Tuesday, Jan. 12, 2016.